To be addicted is a really unfortunate problem to cope with, but lots of addicted persons tend to be egoistic a little bit - they are shouldering their own problems to their relatives, family and friends, and don't want to solve them individually just because of the muddled brain and uncontrollable emotions. But what do other persons have to do, if happen to live with such a gambler? This disease becomes a part of their life too, because while the addicted gamblers are playing, their close people have to act in some way - to obsess about finding necessary words as the strongest weapon, or to appeal to the specialists for help. A person with the most direct purpose to help the ill person may cope with this. 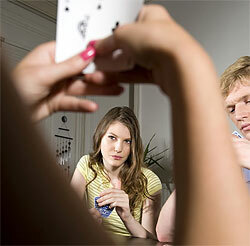 What to do if somebody around you gambles very much? Your task is to convince such gamblers that their playing has lots of negative consequences. But you are not going to sermonize about gambling addiction itself - you have to be more tricky: tell the addict that you don't want to agree that he comes late; that there is no more money not even to gamble but also to eat (you can hide it); you don't like that he/she's lying;, you can't trust him\her no more etc. This is the least that you can do, but, still, if you start yelling at the player that he\she is sick and you want a divorce or just you won't talk to him\her any more - that won't work. This resentment will show the range of responsibilities that a gambler has still to take. In addition to these statements, you can create some determined rules for the gambler: be honest (not - "don't lie"), be punctual (not - "don't come so late"). The other thing that each familiar of the addicted gambler can do - is to show the total understanding. And even if you're really disappointed and angry, don't let your feelings go out. Don't ever make the provocative situations- just don't go near the casinos, don't watch such TV shows and don't let a gambler have a large sum of money. But the most effectual thing that each person can do - is to apply for the professional's help, who will be solving and curing this disease in the proper way. And the results will be not far off.